I have previously used spices from Raw Spice Bar in a few recipe posts. I recently received freshly ground Garam Masala spice from them and decided to incorporate it into one of my recipes using ingredients from Milk and Eggs! Check out a hearty steak recipe that is perfect for dinner! I adapted the recipe (but changed a lot!) 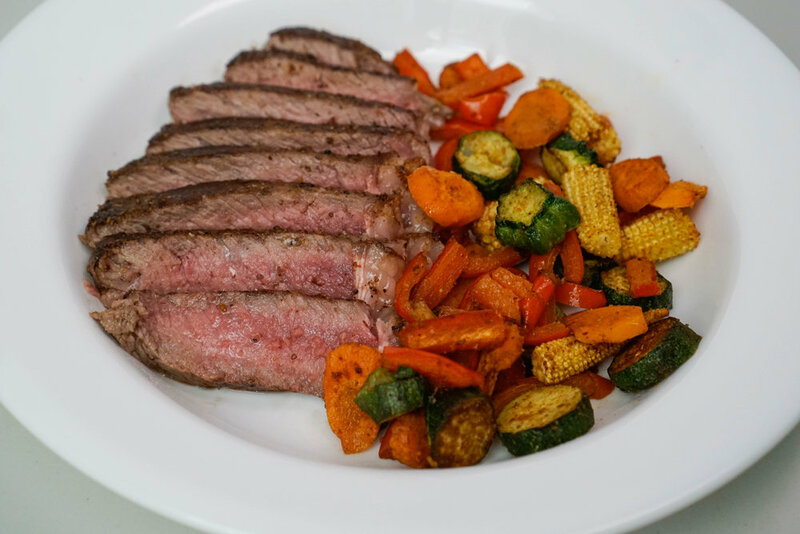 from here: https://www.laurasleanbeef.com/recipes/garam-masala-steak-with-roasted-veggies. Time: 30 minutes. Serves: 2. 1. Preheat the oven to 400°F. Place the zucchini, red bell pepper, baby corn, carrots, paprika, cumin, 1 tablespoon of the vegetable oil, salt, and pepper on a cookie sheet. Toss to coat the vegetables evenly. Roast the vegetables in the oven until the carrots are tender, for about 25 minutes. 2. While the vegetables are roasting, season the steak with salt and pepper, and rub the steak with the garam masala seasoning on both sides. Heat the remaining tablespoon of oil on a skillet and place the steak on the skillet. Cook until your desired doneness; for medium-rare, I cooked about 5 minutes on each side. After it is cooked, transfer it to a cutting board or plate to rest for about 5 minutes before cutting. 3. When the vegetables are done roasting, remove from heat and add lemon juice onto the vegetables and stir to combine. 4. Divide the steak and roasted vegetables among 2 plates. Serve and enjoy!